Admit it, you’re a little different. A tad off kilter. A bit misunderstood. But, as Ralph Waldo Emerson pointed out, is it so bad to be misunderstood? Pythagoras was misunderstood, and Socrates, and Jesus, and Luther, and Copernicus, and Galileo, and Newton, and every pure and wise spirit that ever took flesh. To be great is to be misunderstood. So keep at it, do what you do, and know that you’re in good company. 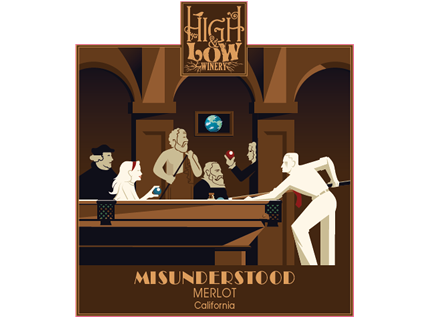 Merlot went from the most popular red wine to much-maligned, thanks in large part to “Sideways.” While Merlot may have been the punch-line, its bold aromas of black cherry, raspberry, and plum are nothing to laugh about. We felt that Merlot is often misunderstood and so wanted to play to its strengths. Our Merlot has substance in its black cherry notes and finesse in its vanilla hints. This wine undoubtedly would play the straight man in any comedic duo. We find that our Merlot pairs especially well with duck or venison. Or pair it with whatever you prefer, or with nothing at all! At the end of the day we like to say, Drink it, don’t overthink it.